BELFAST — Celebrate the 259th birthday of Scotland’s most beloved storyteller, poet and lyricist, Robert Burns. The annual Burns Night is set for Saturday, Jan 26,at the United Farmers Market of Maine, 18 Spring St. This new, larger venue should easily accommodate the crowd, with maybe even room for dancing. The event starts with an optional Scotch tasting at 4 p.m. Doors open for dinner at 5:30 p.m., and the evening’s program begins at 6 p.m.
Burns Nights are held across the globe to celebrate the contributions of Burns’ work to preserving Scottish culture and heritage in Scotland and abroad. These events range from stately, ostentatious gatherings of esteemed scholars and nobles to rowdy, raucous shindigs at local pubs. Ours will fall somewhere in between. Tickets for the dinner, featuring traditional Scottish fare (yes, that includes haggis), are $20 in advance or $25 at the door. For $35 in advance or $40 at the door, you can take part in the Scotch tasting, with dinner included afterward. Advance tickets can be purchased online at www.mainecelticcelebration.com or locally at Left Bank Books on Church St. in Belfast. Proceeds benefit the Maine Celtic Celebration, and help us plan and grow our annual summer festival on the Belfast waterfront. Scotch tasters will tour through a range of whiskies from different regions of Scotland, from the peat-powered smokiness of Islay, to the vanilla and toffee notes of Campbeltown. 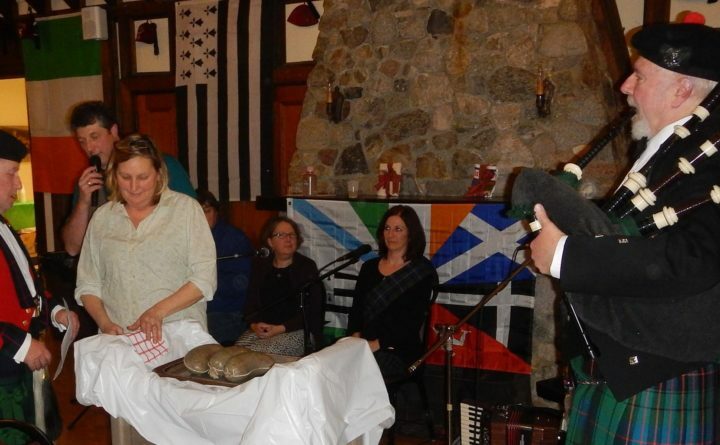 The evening dinner program will feature traditional Highland piping, tunes and songs from Celtic lands by Chris Brinn and friends, presentation of the haggis, toasts to the laddies and lassies, and more. Attendees are encouraged to put their Celtic pride on display. Don your kilts, display your clan tartan proudly, or polish up your speaking skills. Prizes will be awarded for best traditional dress and recitations of Burns’ poetry. Burns’ work can be found at www.robertburns.org/works if you need inspiration.